Daily Oklahoma Cash Grain Prices- as reported by the Oklahoma Dept. of Agriculture on Thursday, May 10th. -- Today- Lahoma Field Day- Say Hi to Carson Horn! The USDA issued their first wheat crop production estimate for the 2018 production cycle- and it shows that the hard red winter wheat crop will be significantly smaller than 2017 production. Hard Red Winter production, at 647 million bushels, is predicted to be down 14 percent from a year ago. In the southern great plains- where harvest is just weeks away- the drought stressed Oklahoma, Kansas and Texas crops are well below 2017 production. The Oklahoma wheat crop is expected to be 47% smaller than a year ago, with total production of 52 million bushels being based on 2 million acres that will be harvested- with an expected yield of 26 bushels per acre. The 52 million bushel total is six million fewer bushels than was predicted by the Oklahoma Grain and Feed Association nine days ago. For Kansas- we are talking 19% smaller than a year ago- USDA guesses that Kansas will harvest 270 million bushels- in Texas- they are facing a 37% smaller crop this season with an output of 42.3 million bushels. Click here for more on the May Crop Production Numbers that featured the winter wheat crop estimates. 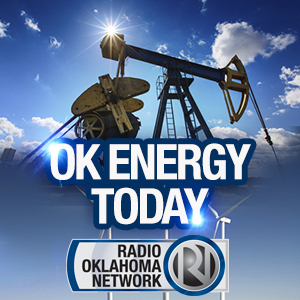 Meanwhile- the WASDE report has a ton of data on this year's numbers and 2019 numbers as well- Dr. Kim Anderson of Oklahoma State talks WASDE with Lyndall Stout- you can get his take on the report by clicking or tapping here. The folks at Allendale give us a few of the highlights that we can share- "USDA's Supply and Demand report had US old crop corn ending stocks left unchanged at 2.182 billion bushels, just above the trade expectation of 2.178 billion. New crop stocks were 1.682 BB, also above the estimate of 1.628 billion. Old crop soybean stocks were lowered from .550 to .530 billion bushels, a little more bullish than the .541 guess. "The real surprise was in the new crop stocks of .415 billion bushels. Traders were expecting .535. The new crop number left traders scratching their heads though as the lower carryout number was a result of a higher export sales estimate. Time will tell. "Wheat old crop stocks were raised from 1.064 billion to 1.070. New crop stocks were reported at 955 million bushels. The trade guess was 930." Today- Lahoma Field Day- Say Hi to Carson Horn! It's a new world at the Lahoma Field Day- as farmers gather for what has traditionally been the statewide field day for winter wheat. Wheat will be a big part of this field day as always- but it will also be one of your first opportunities to meet our brand new Cotton Specialist for OSU- Dr. Seth Byrd. Cotton and soybeans are competing with success in taking acres from wheat in Oklahoma- we discuss that in a story below that looks at one of the counties that a few years back was always one of the top ten Oklahoma wheat counties- Kay County- and how this past year they had more acres in soybeans than wheat- and OSU including Dr. Byrd in the Lahoma program is recognition of the rapid increase in cotton acres in many areas of the state even as Oklahoma produced its first million bale cotton crop last year since the 1930s. If you are at Lahoma today- be sure and look for and say hi to our Associate Farm Director Carson Horn as he represents us at the 2018 Tour. During Wednesday's ceremony at the State Capitol for the presentation of the Governor's 2018 Excellence in Agriculture Awards, Kayse Shrum, president of the Oklahoma State University Center for Health Sciences, announced that Oklahoma 4-H and FFA would receive a $2.8 million gift to fund scholarships for student members interested in pursuing a career in medicine. This gift marks a collaborative initiative between OSU-CHS and FFA called Blue Coats White Coats that promotes youth in agriculture to chase their dreams of becoming a physician or medical professional and encourages them to consider returning to rural areas to care for underserved communities in Oklahoma. Shrum, who spoke with our Associate Farm Director Carson Horn, says these gifts will help OSU-CHS in its mission to combat the growing physician shortage in rural Oklahoma. "When we began this partnership with FFA and other people in agriculture, I think people found it a little bit odd and were scratching their head asking 'How does a medical school fit into the agricultural community?' But, agriculture is so important to our state, to our nation and without physicians in our communities, our farmers can't continue to do what they do," Shrum said. "So, in order for them to be successful, we need to make sure we're fulfilling our obligation and our mission to make sure we're caring for them adequately." The gift was made possible by two separated donations of $1 million from the Joseph E. Robert, Jr. Charitable Trust, and $1.8 million from the Estate of Audrey M. Hendershot. Neither Mr. Robert, a financier and philanthropist from Washington D.C., nor Mrs. Hendershot, a widow in Shawnee, Oklahoma, were OSU alumni. However, OSU alumni played a critical role in making these gifts to OSU-CHS possible. Read more about this generous gift and its significance to the educational opportunities for our youth in agriculture, and also listen to Shrum's full interview with Carson, by clicking here. According to Vince Peterson, president of the US Wheat Associates - the marketing arm of our national wheat industry, times are changing. He says foreign market access has become a thing of uncertainty with multiple trade deals like NAFTA and TPP all up in the air these days. Maintaining existing relationships and racing to build new ones seems to exhaustively command his attention lately. Changing, too, is the way business is done in general with a growing private sector that seems to be taking over control of decisions that were once made by government entities. We caught up with Vince earlier this week in Kildare, Okla. during one of the stops on the 2018 OSU Wheat Tour. He gave us a bit of an overview of what the wheat industry is up against now days. Not long ago, when it came to selling wheat abroad - you dealt with that country's government. 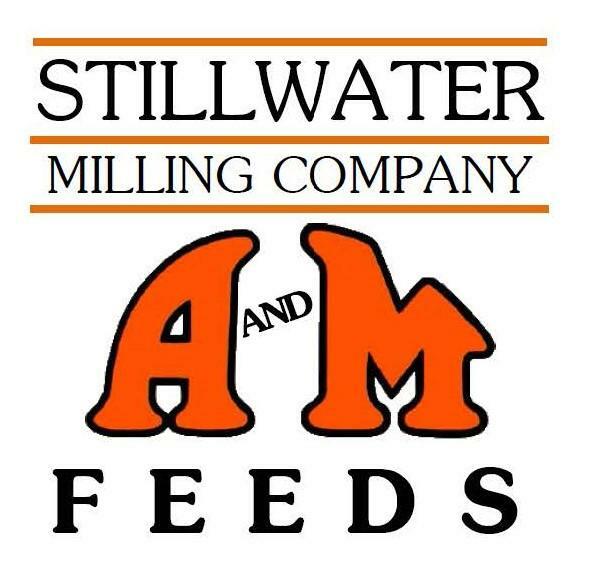 Today, Peterson says he and his staff work directly with individual milling companies and bakers - each with their own preferences and goals. "Frankly, it puts a bigger burden in a certain way on us. Used to there was one buyer - the government of Mexico for example," he said. "Now, you've got six milling syndicates down there. They're all individually making decisions on imports. They're in a competitive circumstance and now we have to work with them and probably 100 facilities just to do that business down there. It really puts the task to us to do that." And if that wasn't enough to worry about, Peterson says the industry is heavily invested in a positive outcome regarding US trade policies as well. For instance, pending certain political decisions - if China were to follow through on the tariffs it has threatened against wheat - the US would most likely lose all its business there and rather large chunk of its total Asia/Pacific portfolio. It is simply a situation he implies farmers can't afford to see happen, especially in this economy. Click here for more of Peterson's insights into the wheat industry and the importance of global commerce. On Wednesday, Jimmy Kinder of Walters, Okla. was honored by Mary Fallin with the Governor's Excellence in Agriculture Award for Environmental Stewardship, during a special presentation at the State Capitol surrounded by friends and family. The award presented to Kinder recognizes Oklahoma agriculturalists who are leaders in developing and adopting outstanding environmentally innovative agricultural practices. 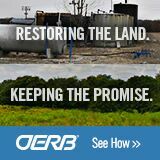 This award highlights the efforts of an Oklahoma agriculture producer who is a steward of the environment and is dedicated to conserving the natural resources of Oklahoma while helping to ensure a continued supply of food and fiber. We spoke briefly with Kinder after he received the award to find out what this honor means to him. "Being able to get an award like this is pretty special," Kinder said. "It's just great to be able to be seen as someone who is an environmentalist and being active in environmental issues." Kinder is a fourth-generation farmer and rancher from Cotton County and an early innovator in Oklahoma agriculture. His family farms 5,500 acres of wheat, canola, sesame, and grain sorghum. They grow 2,500 acres of grass and run stocker cattle. This award acknowledges Kinder's highly-successful implementation of no-tillage cropping, crop rotation, cover crops and stocker cattle grazing. His agricultural production system offers superior economic, agronomic, environmental and social benefits - essentially allowing him to produce more with less. Click here to read more about Kinder and his operation or to listen to his reaction after accepting the award. Up next will be the Tulsa Farm Show in December 2018- the dates are December 6th, 7th and 8th. Now is the ideal time to contact Midwest at 507-437-7969 and book space at the 2018 Tulsa Farm Show. 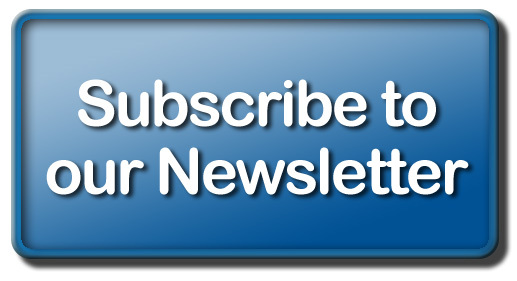 To learn more about the Tulsa Farm Show, click here. Production of hard red winter wheat is under attack in Oklahoma- acres continue to decline- and two spring planted crops that are competing for acres are winning the war in parts of the state. In southwestern Oklahoma, the clear choice for many producers is cotton- and with Oklahoma producing a million-bale cotton crop this past year for the first time since the 1930s- many farmers have been thinking hard about how to include cotton in their crop mix- not just in traditional areas for cotton production- but well north to the Kansas state line. That includes Kay County, where soybeans seem to generate even more interest, local grower Don Schieber's included. Though, he is a staunch believer that wheat can make farmers money - especially if they are willing to step up their management and raise a higher quality of wheat - he also knows a farmer must grow whatever helps them thrive in the current market environment. Listen to Don Schieber and I talk about the 2018 Wheat Plots on his farm- and the changes that have occurred in his county where wheat is no longer the dominant crop as it has long been considered, by clicking here. Little change noted in this week's Drought Monitor compared to last aside from a slight decrease in the abnormally dry to moderate drought rating. Still, 23 percent of the state is shown to be in exceptional drought conditions, primarily concentrated along the western edge and Panhandle. While that area remains in the tight grip of drought, the southeastern part of the state actually had a bit of relief over the past week thanks to some heavy rain storms. Though, Oklahoma Climatologist Gary McManus says you probably wouldn't really know it. More relief may be on the way though according to McManus, who says there will be minor chances of rain coming in the next few days into early next week. 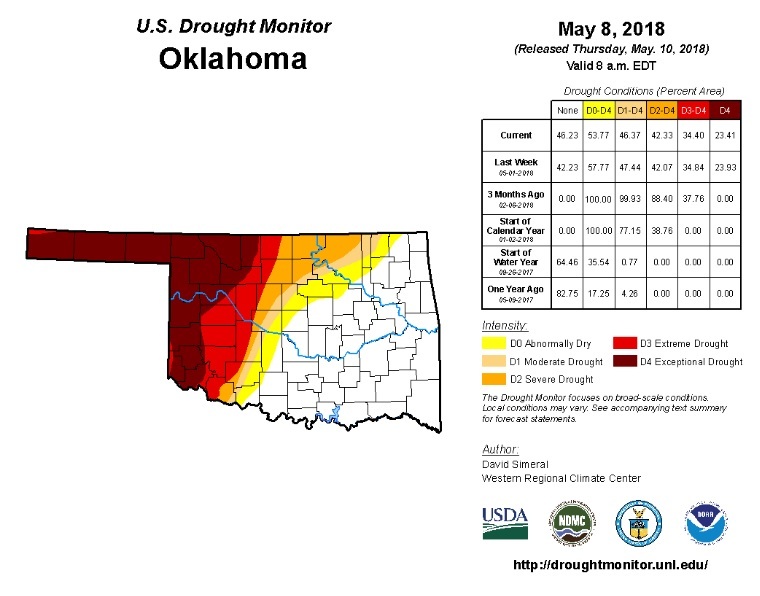 He says it is possible parts of drought-stricken Oklahoma in areas of the northwest may even receive some of that moisture if forecasted storms are realized. Meanwhile, summer temperatures are increasing and with them the fire danger, particularly in the Panhandle region. For a closer look at this week's Drought Monitor map, click here. The Chairmen of the House and Senate Ag Commitees met with President Donald Trump on Thursday at the White House- talking Farm Bill. After the meeting, Chairman Mike Conaway of the House Ag Committee indicated that the President did not offer a veto threat but is " a really strong proponent of the work requirements being improved in SNAP, strengthening SNAP because he believes that work is a pathway to prosperity and that our program should help people get on that path and not trap them in some sort of public assistance program." Chairman Conaway came away from the meeting saying that what he is proposing to do with the nutrition program is in line with what the President wants. This is the same issue that resulted in no Democrats supporting the farm bill when it was marked up in the Committee this past month. Click here to listen or read what Conaway has to say about the meeting at 1600 Pennsylvania Ave with President Trump. BY THE WAY- lots of folks inside the Beltway say that Freedom Caucus members seem to be coming around to Conaway's proposal- and he seems to be getting CLOSER to having enough GOP votes to get the 2018 Farm Bill passed on the House Floor. Floor consideration could happen NEXT WEEK. As it now stands- there are ZERO Democrats who will likely vote for the measure because of the SNAP reforms.